• Via email to kauwaerter@socpa.net.Please put "Request for Proposal" in the subject line. The Syracuse Urban Renewal Agency (SURA), a public benefit corporation of the City of Syracuse, seeks a qualified, multidisciplinary team to plan, design and develop construction specifications for a public space in the center of Downtown Syracuse, New York. The project will transform an underutilized plaza and green space in Downtown Syracuse into an active and inviting public space, encompassing urban and landscape design and context sensitive public art. The roughly one acre site is located on the 200 block of South Salina Street between West Washington and West Fayette Streets and includes a plaza and terraced lawn area. The successful team will work directly with the project Advisory Committee and Design Advisor as well as stakeholder groups and the public to develop a design concept for the space. Once the design is approved, the team will be responsible for developing the construction-level plans and specifications for the project. This is a two stage proposal process. In this first stage, respondents are requested to present their qualifications that demonstrate experience and expertise in the areas of urban and landscape design, context-sensitive public art, and public participation. Because public art is an integral component of this project, a public artist must be part of the project team. Please submit all questions to kauwaerter@socpa.net by Monday, December 8, 2014. An official response to all questions submitted will be posted on the SURA website no later than Friday, December 12, 2014 at 4:00 pm EST. Q: Please clarify the second round of the selection process – what will you be looking for from the three shortlisted teams, a fuller proposal describing scope and fee, or an actual proposed design of the plaza with the art piece? A: In this first stage, SURA is asking for team qualifications only (please see submission requirements on Page 6 of the RFP). During the second stage, the short-listed teams will be asked to provide a scope and fee proposal based on additional budget information provided to them. No design for the site is necessary at this time. Q: On page 4, you have outlined the two phases to the RFP process. For phase 2, is there a fee associated with being shortlisted and for providing a full proposal? Are you looking for design concepts for the site from firms selected for phase 2 of the RFP response? A: There is no fee associated with being shortlisted, and SURA will not request design concepts from the shortlisted teams. SURA will provide the shortlisted teams with additional budget information and will request that they provide a scope and fee proposal based on this additional information. The shortlisted teams will be invited to come to Syracuse to present their qualifications to the jury. Q: On page 3, under Budget & Schedule, you list the total cost of the project to be estimated between $2-4 million. Does this funding cover design, construction, and the payment for the public art installation? A: Yes, this number is inclusive of design, construction and public art. Q: Do you have a specific target of WBE/MBE participation? A: The City’s general goals are 9% MBE and 6% WBE. Q: Does our firm need to be registered to do business in New York State? A: Applicants of foreign business entities must be authorized to do business in New York State or commit to becoming authorized to do business in New York State prior to an award of contract. Domestic firms by their nature of creation will be authorized to do business in New York State. But all entities must be in good standing with the New York Department of State. Q: At what point will there be clarity on the budget and is there a fundraising component built into the process? A: The budget for the project will be clarified at the design phase. Yes, there is a fundraising component built into the process. Q: At what phase will funding be made available to the selected team? A: Design funding will be made available after contract execution. Q: Can the final professional team be finalized after the RFQ stage? A: SURA strongly encourages that the names of the core team members be presented at the time of the RFP submission. Q: Should the team composition for the RFP include all consultants from predevelopment through construction? A: SURA expects that the core team for the entire design phase of the project will be identified at the RFP stage. Construction and inspection related contractors will be determined at a later date. Q: Is there an existing survey and geo-tech report for the site? A: SURA will provide a survey of the site. There is no geo-tech report for the site. Q: Do all members of a team complete the signed attachments A-E? A: Only the firm taking the project lead need fill out and sign the Contractor/Vendor forms A-E.
Q: Is there a page or project limit to the application? A: No. 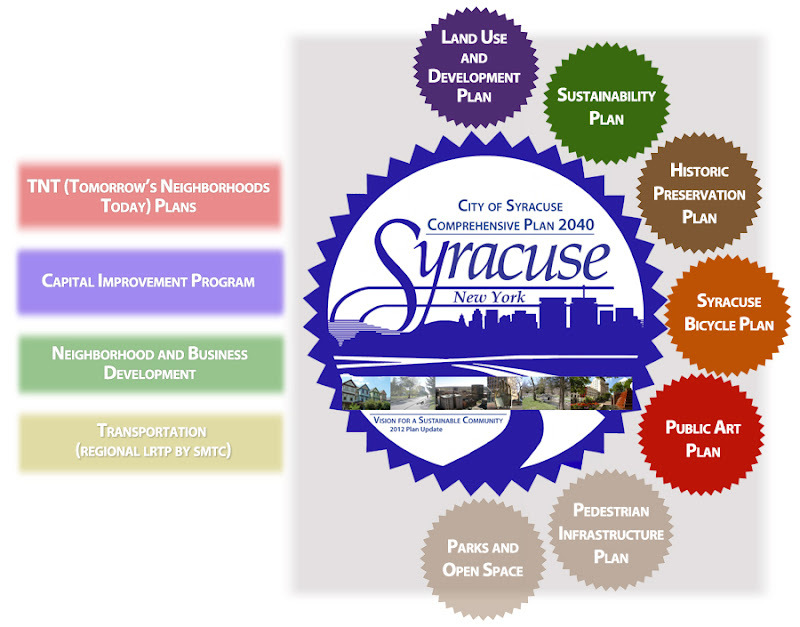 However, please only include projects that have relevance to Syracuse and this proposal. Q: We are aware that the total cost of this project is estimated to be between $2-4 million. Would you be able to tell us how much is available for design fees? And if that fee amount is currently available or if it still needs to be raised? A: SURA continues to refine the budget and more detail will become available as the project is advanced. Q: The schedule states: The successful project team will be selected on or around January 31, 2015; and The final design will be selected on or around July 15, 2015, after which the design team will develop construction documents. Is there an expectation that the project team will create multiple plans for the selection committee to choose between on July 15? Or would multiple project teams be contracted up until July 15? A: A single project team will be selected in January. The team will develop and refine a design for the site through an open, public participatory process. The final approval of the design will take place on or around July 15, at which point the same team will develop construction documents for the site based on the selected design. Q: Is the Pinto installation and/or M. Paul Friedberg landscape or any of its features (terraced lawn and brick piers etc.) considered by New York State, the City of Syracuse, or Cultural Landscape Foundation to be a historically significant modern landscape? Is Jody Pinto’s art installation in any way protected? A: Perseverance Park has not been identified as a historically significant modern landscape by New York State, the City of Syracuse or the Cultural Landscape Foundation. The Pinto installation is not protected. Q: Will a State Historic Preservation Office review be required related to the impacts of the new design on the site? A: The site is located adjacent to the National Register-listed South Salina Street Downtown Historic District. In the case of State funds being part of the design or construction of the project, the State Historic Preservation Office will review the proposed design for any potential affect on the character of the adjacent historic district. Q: It is clear to me from reading the RFP that adding a public artist to our team is needed. Are there any other subconsultants you recommend adding to your team? A: We are seeking a multi-disciplinary team that will have the skill, experience and professional expertise to plan, design and develop construction documents for the site. Therefore, in addition to a public artist, the team should include individuals who are professionally licensed to produce the construction specifications used to bid out and construct the project. Q: Do you have any guidelines or criteria for public art you suggest we follow? A: The Syracuse Public Art Commission will review any artwork that is part of the redesign of the site. Below are the seven (7) criteria that the Commission has outlined as part of its rules and procedures. Some criteria will have more relevance than others depending on the proposed artwork; the Public Art Commission weighs the criteria accordingly. • Installation and maintenance of the work, from practicality of fabrication and transport, to installation and long-term care. Q: Is there any local feeling toward the use of water or fountains in the public art piece? A: Water features may be considered for the site. However, as outlined in the RFP, any features designed for the site must be durable and maintainable. Q: Is it better for us to team up with artists within your pool? A: There are no pre-qualified public artists for this project. Please see the list of artists posted on the project website that have indicated an interest in participating in this project. Please note that this is not a pre-approved or recommended list, but an attempt on SURA’s part to link artists with design teams for the purpose of this RFP. Q: Is there any preference for local artists over national artists? A: The public artist will be judged on the quality of his/her experience and portfolio only. Q: Do you see this as a project that should be led by an artist? A: A public artist could be the lead, but it is not required. Q: Will the public artist on the project team serve as an advisor only, or is intended to be the artist for the project? A: The public artist is intended to be the artist for the project. Q: Instead of a public artist, is it possible to team with a public art broker/curator who would identify later an artist that suits the design vision for the plaza? A: No. SURA requests that a named public artist be provided at the time of submission. Q: Can art be done by a qualified landscape design firm? A: No. SURA requests that a public artist be identified as part of the core team. Please note that we have posted the names of artists who have indicated an interest in participating in the project on the project website. Q: What is the timeline for the creation of the artwork? A: The purpose of having a public artist as part of the design team is so that the design of the artwork will be in collaboration and concurrent with the design; fabrication and installation of the artwork will be concurrent with the construction of the space. Q: The RFP describes integrated public art as part of the design solution for the site and artist(s) as an integral part of the project team. Is it possible to include a public arts consultant instead of an artist initially to help us work with the city/SURA/ stakeholders and design team to help select artist(s) based on a more detailed exploration of possible arts program for the site? A: As noted, SURA has asked for a public artist to be identified as part of the core team. Q: Can you provide more detail on a range of what types of public art installations you might envision? A: SURA acknowledges that it has provided limited guidance regarding the type of artwork that might be installed as part of this redesign. The RFP states on Page 4 that the artwork should be “place-based and context sensitive.” Other characteristics of the overall design and the artwork include playful, accessible and maintainable.